In 2012, Comcast – which had just finished purchasing NBCUniversal the year before – made what is a now-legendary announcement: it was going to spend $500 million a year on both of its American theme park locations, opening up at least one new attraction, restaurant, and/or hotel each and every year. Although we have yet to hear whether this money spigot is still set to this insanely-high level, we do know that Comcast has certainly widened its overall purview, having bought out Universal Studios Japan entirely and snatching up DreamWorks Animation in order to add to its themed wares (spending some $6.1 billion in the process). All of this is noteworthy because it goes a long way to explaining why The Walt Disney Company has suddenly decided to go full speed ahead in the announcements department at this past weekend’s biennial D23 Expo – from new major rides to fancy restaurants to revolutionary new hotel concepts, Disney Parks and Resorts made a really strong argument as to why it should still be considered the theming king (along with the undisputed Orlando market-share leader, as well). What is equally notable about the bevy of new commitments is the sheer amount of money that it’ll cost the company – Comcast, it seems, is no longer the only player in town unafraid to drop billions of dollars in a single year to substantially expand its theme-park footprint. The general purview of all of Disney’s planned additions is the fast-approaching 50th anniversary of Walt Disney World Resort, which technically falls on October 1, 2021 but which will be celebrated the whole year (if not longer). 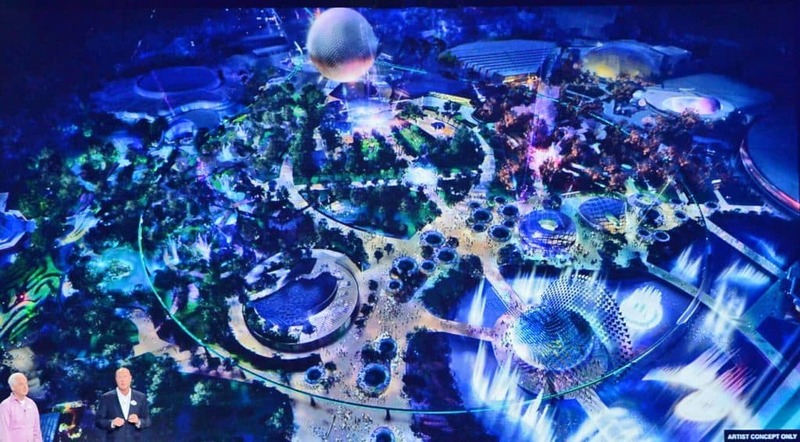 The company wants to have each of its four theme parks be fully stocked with new attractions or lands, along with, in some cases, reimagined aesthetics. Along the way, we’ll also be getting two new hotels – along with this week’s just-opened Copper Creek Villas & Cabins, the latest Disney Vacation Club property – and brand-new transportation options, which, for a 13,000-acre resort, are quite important. We understand that keeping up with all of these projects can be difficult, let alone trying to place them all within one single timeline, so we decided to help. Below is our best guess as to when each and every one of the 15 just-revealed additions will be arriving at Disney World, but please be aware that, Disney being Disney, some of these projects are likely to get delayed – although rest assured that the 50th anniversary provides a firm motivator to keep all the executives, Imagineers, and construction workers in line. Without further ado, here is what you can expect to see land at Disney’s Orlando resort over the course of the next four years. Disney’s answer to Uber is the very first new development to materialize at Walt Disney World, even though it was only officially announced four days ago. For $25, guests at the resort can hail one of these specially-decorated Chevy Traverses (that’s an electric SUV, in case you’re curious) on a mobile app and hitch a ride to anywhere on Disney property – whether that be a theme park, a hotel, or Disney Springs – or, in some instances, to Orlando International Airport, in order to catch a departing flight. Although not as exciting as, say, a brand-new E-ticket attraction, and although another upcharge service at Disney World, these cutely-named Minnie Vans can prove to be a real benefit to those willing to utilize them, especially when attempting to circumvent the oftentimes-lengthy bus service that otherwise would be an on-site visitor’s only other main recourse. 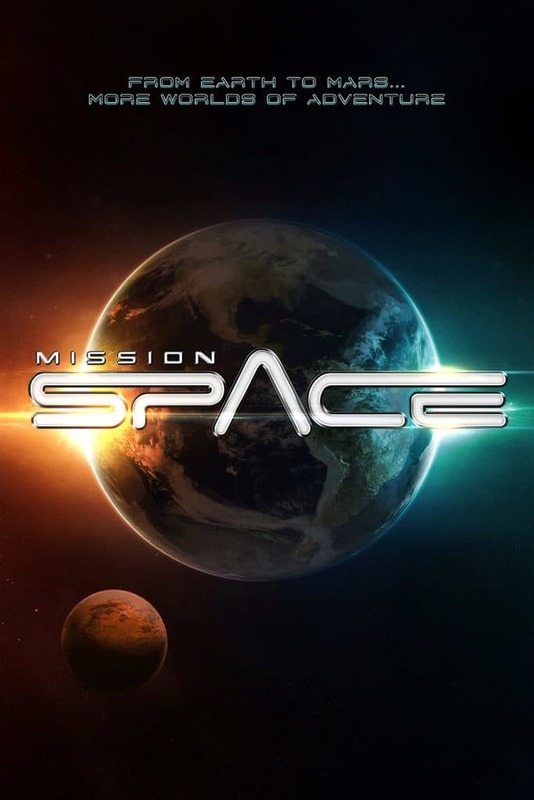 Mission: Space shut completely down on June 5, 2017 for the first time in its 14-year history for a lengthy refurbishment, and when it reopens in just a few weeks, it’ll feature a brand-new mission for guests to undertake. In order to fully appreciate this development, we have to backtrack for just a moment. 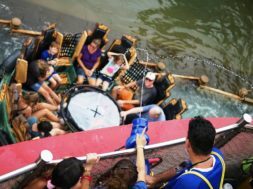 When the thrill ride opened in August 2003, it proved to be a little too thrilling for some, resulting in some minor injuries and, even, two deaths (since its centrifugal spinning aggravated certain pre-existing conditions, such as high blood pressure). Three years later, Disney opted to take one of the two ride vehicles and to significantly tame down its motions, dubbing it Green Team (and, thereby, making the original version of the ride Orange Team). Now, Disney has just told us over the weekend, the green version will feature an entirely different premise: instead of going to Mars, families will be taking a quick, tranquil jaunt to Earth’s orbit and back. Don’t worry, though, thrill seekers – the Orange Team’s mission will be getting an entirely new ride film, supplied by none other than Industrial Light & Magic. 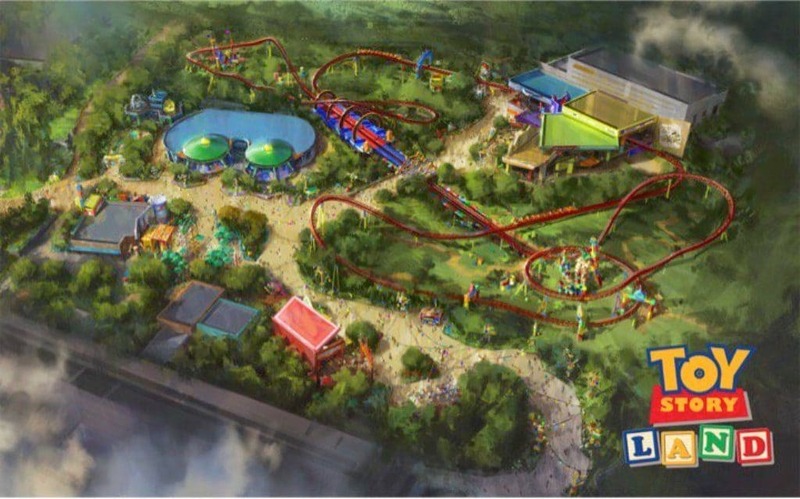 It’s hard to classify D23’s huge bevy of revelations as a disappointment, but if there was one specific way in which the announcements were lacking, it was with Hollywood Studios’s Toy Story Land. 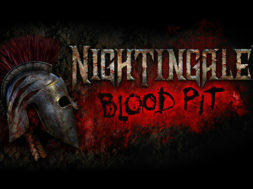 Originally announced at the previous D23 expo (that would be back in 2015, for all those playing along at home), we’ve long known what rides will be arriving alongside the new expansion, but we’ve had certain other questions go unanswered ever since, such as what would the other, mini-attractions consist of and just when it would debut. Now we know the latter: summer 2018 is the land’s official opening date. Hopefully, Disney will give us even more to chew on sometime soon, especially considering that we’ll all be able to get miniaturized and to frolic in Andy’s backyard sooner than we all realize. Since the next-door Norway pavilion in Epcot’s World Showcase has gotten a great deal of new attention, thanks to the addition of Frozen Ever After last summer, Disney must have decided that a new attraction in China might help to manage the massive crowds. 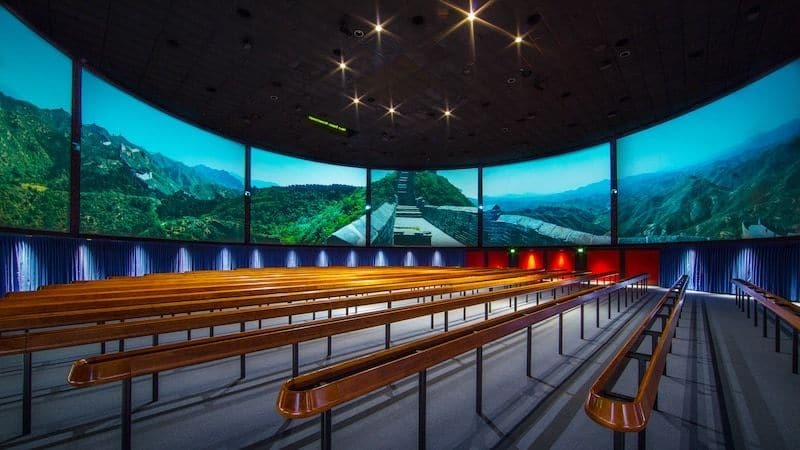 Then again, the location’s Reflections of China Circle-Vision film, which debuted in 2003, is an easy enough target for replacement, especially considering that Walt Disney Imagineering has been hard at work developing a “next-generation” digital camera system for a little while now. While we have few hard details on the new Circle-Vision production, we do know that it’ll certainly be filmed in China once again and that it will highlight the “splendor and majesty of that amazing country.” Expect to see other new such films in the years to come at all the other Disney parks across the globe. The Great Movie Ride has been the hallmark of Disney’s Hollywood Studios ever since it first opened with the park on May 1, 1989, acting as a classic dark ride while also embodying the would-be backlot’s filmmaking spirit. 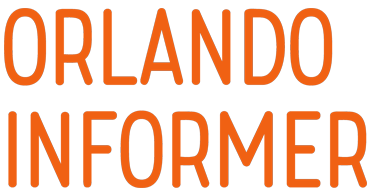 Now that the Hollywood Studios of yore is being swiftly replaced, however, by a more traditional theme-park mandate – as demonstrated by the likes of Toy Story Land and Star Wars: Galaxy’s Edge – a new flagship attraction is needed to headline the location. Enter Mickey and Minnie’s Runaway Railway. 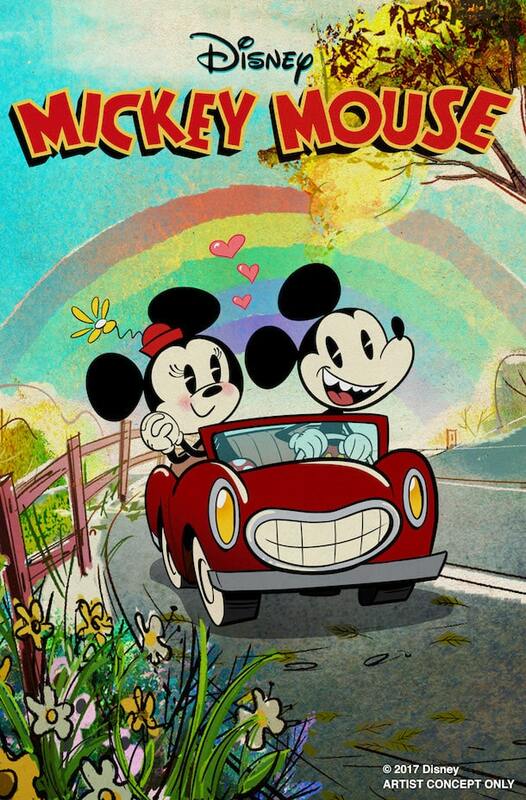 The first-ever theme park ride to star Mickey Mouse is themed to the new Mickey shorts that are currently making the rounds on The Disney Channel, with the premise specifically being that guests get swept up into the cartoon world when Goofy, the conductor of a train that both Mickey and Minnie hop on, messes up and crashes the boundaries between our two realities. 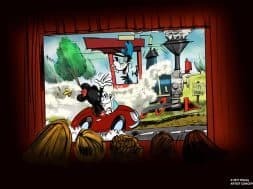 Disney boasts that it’ll be the first 2½D ride, using projection mapping to make a flat world pop up in front of – and around – the ride vehicles. The Great Movie Ride closes on August 13, 2017, in order to make way for Runaway Railway. If you can’t make it to Walt Disney World by then, be sure to take a virtual trip down memory lane with our in-depth feature. We’ve actually known about the new gondola system since February 2017, thanks mostly to permits being filed for construction work to commence, but Disney still managed to surprise with a look at the final ride vehicles’ designs and the new transportation system’s official name: the Disney Skyliner. Here’s the scoop: a new skyline will ultimately be connecting six different points across Disney World – Epcot (at its International Gateway entrance), Hollywood Studios, Caribbean Beach Resort, Pop Century Resort, Art of Animation Resort, and the just-announced Riviera Resort (more on which in just a moment). 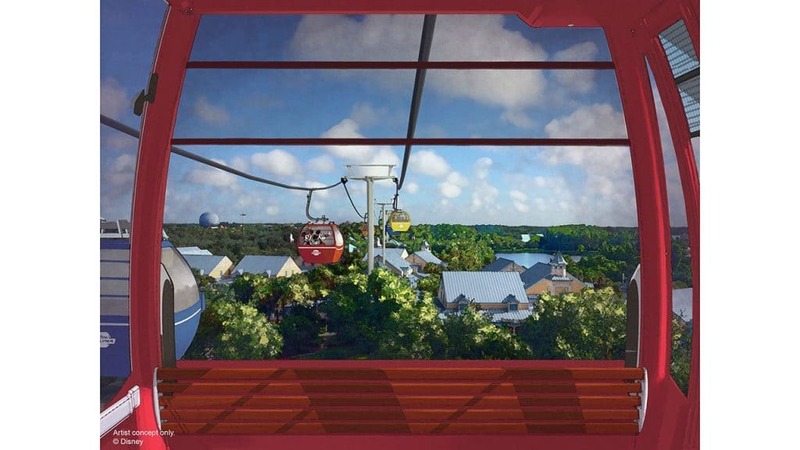 Each individual gondola will feature a different Disney character, ranging from an old-fashioned Mickey Mouse to the ghouls from Haunted Mansion, and there’s even been word already making the rounds that Disney would like to extend the Skyliner all the way over to Animal Kingdom Lodge at some point in the future. 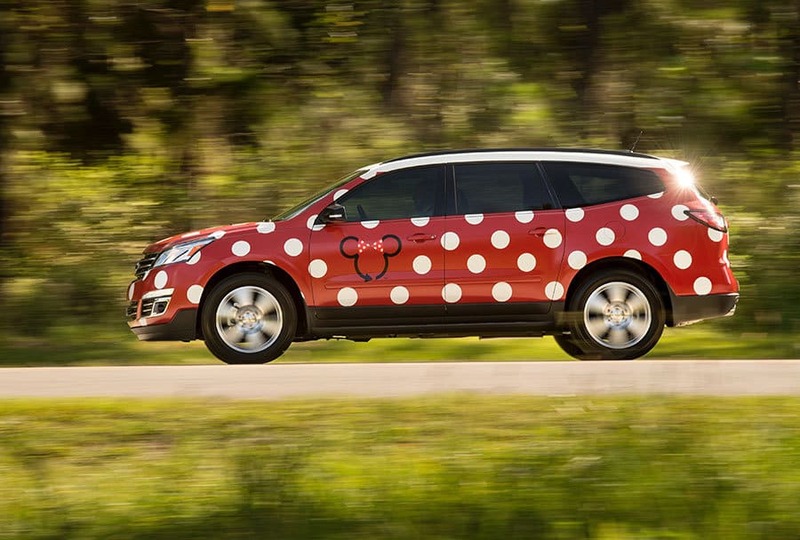 Along with the Minnie Vans, getting around Disney property is going to be faster than it ever has been before – which is an absolute necessity, given how massive the crowds are going to be in 2021. Epcot has long been known for its exquisite dining, and now Disney wants to extend that dominance even further – into Future World, which is gastronomically sparse (well, compared with World Showcase, at least). This new, still-unnamed restaurant will be positioned next to Mission: Space and will use that attraction’s premise as its theme, placing diners high in orbit above the Earth in order to allow them to enjoy “great meals and an even greater view.” It will be operated by the Patina Group, which already oversees several establishments on Disney World property, including Epcot’s own Tutto Italia and Via Napoli. Though that literally comprises the entirety of Disney’s D23 reveal, the concept art speaks for itself – as does the rest of the park’s culinary pedigree. UPDATE (1:19 pm 05.09.18): Disney has just officially divulged the location of this brand-new eatery: a “newly-developed area” that will be situated in between Mission: Space and Test Track. What can be described as the star (no pun intended) of the 2017 D23 Expo is the area of Hollywood Studios formerly known as Star Wars Land, with many pieces-parts having been outright revealed or otherwise strongly hinted at. 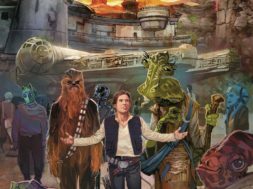 No, we may still not have a name for either of its two attractions, but we do have more than enough new tidbits to keep us satiated as the long wait until 2019 continues – starting with that new official name, Star Wars: Galaxy’s Edge, which emphasizes its placement on the Star Wars galactic map: one of the very last stops before Wild Space. What else did we learn? 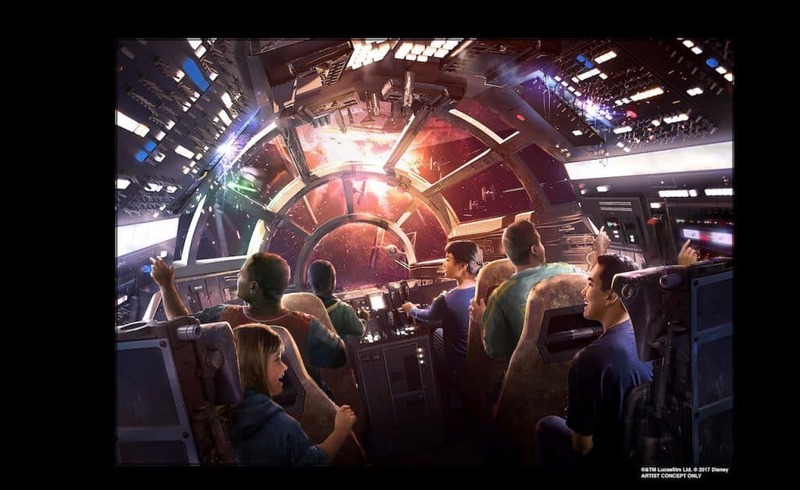 The Millennium Falcon ride will feature six people in the cockpit at a time, with some (or, possibly, all) of them being given specific job functions, such as prepping the jump to hyperspace. Its backstory, meanwhile, has the cartoon character of Hondo Ohnaka (who was a recurring presence during Star Wars: The Clone Wars’s six seasons) trying to convince Chewbacca to go out on some sort of mission with him, which means that they now need to scramble for a new flight crew. 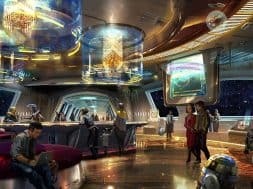 Other announcements include Kylo Ren as a meet-‘n-greet character, a return appearance by RX-24 (the audio-animatronic pilot of Star Tours’s original incarnation) as a cantina DJ, and the land’s serving of blue milk, which, apparently, will be Galaxy’s Edge’s main competitor with The Wizarding World of Harry Potter’s Butterbeer. 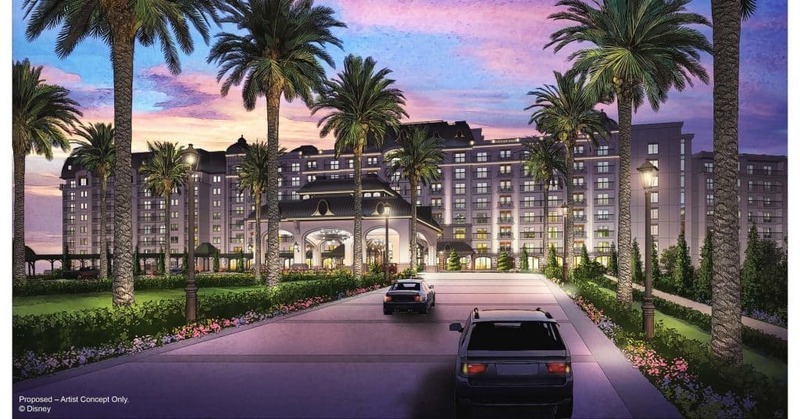 Somewhat lost amidst all the spectacle and glamour of the other D23 headlines, Disney also snuck in the little revelation that the 15th Disney Vacation Club property will be arriving in the Epcot sphere of hotels in the form of Riviera Resort. Not much was actually disclosed beyond a few scant details: the new venue will consist of approximately 300 units, which will comprise a “variety of accommodation types.” Furthermore, the new Skyliner gondolas will connect Riviera to the rest of the local resorts and theme parks, which will presumably make it instantly jump to the top of many DVC members’ wish lists. The juiciest tidbit, however, has to do with a rooftop bar, which will enable beautiful views of both Epcot’s and Hollywood Studios’s nighttime shows. If this sounds suspiciously like a direct response to Universal Orlando’s Aventura Hotel to you, you’re not alone in making the comparison. 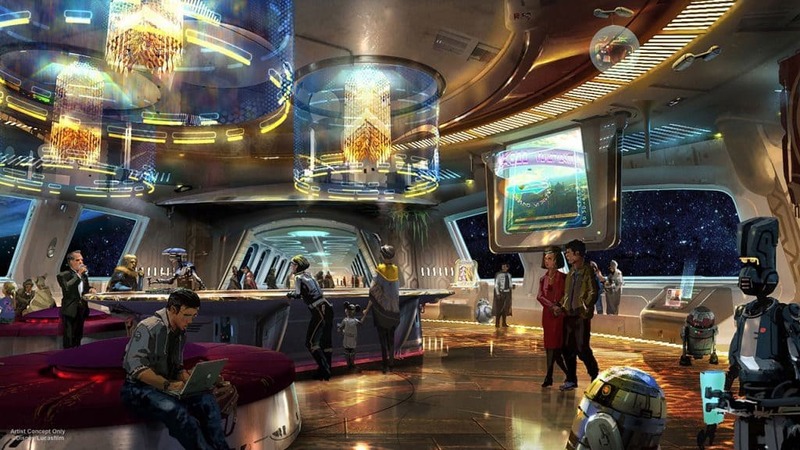 It’s hard to not overstate the potentially revolutionary nature of the Star Wars-themed hotel, even considering what will likely be its exorbitant prices. The premise behind this boutique property goes a little something like this: guests will reserve multi-day packages, which will see them stay in a room that is themed as a cabin on a starliner (including views out into space). While they wait for the vessel to “dock” at an alien planet (which will more than likely be the fictitious location of Galaxy’s Edge’s trading outpost), they can dress up as a character from that galaxy far, far away, select exclusive “missions” to take on, and interact with a cast of employees who never break character. Disney is calling this the very first product of its new “Disney 360” line of vacation experiences, which means that every second of every hour of every day spent in the package will have you be totally absorbed in some sort of narrative. Expect Universal – and all the rest of the theming world – to follow suit, and soon. This is the one announcement that no one saw coming, though, in retrospect, it makes perfect sense. To understand what Disney is going for with Magic Kingdom here, we must first take a quick detour to the West Coast and California Adventure’s Hyperion Theater, which is a roughly 2,000-seat auditorium used for rather big and elaborate stage productions (and the occasional movie screening); Aladdin: A Musical Spectacular dominated most of the Hyperion’s lifetime, having been performed from 2003 to 2016, with Frozen – Live at the Hyperion having only recently taken up its place. 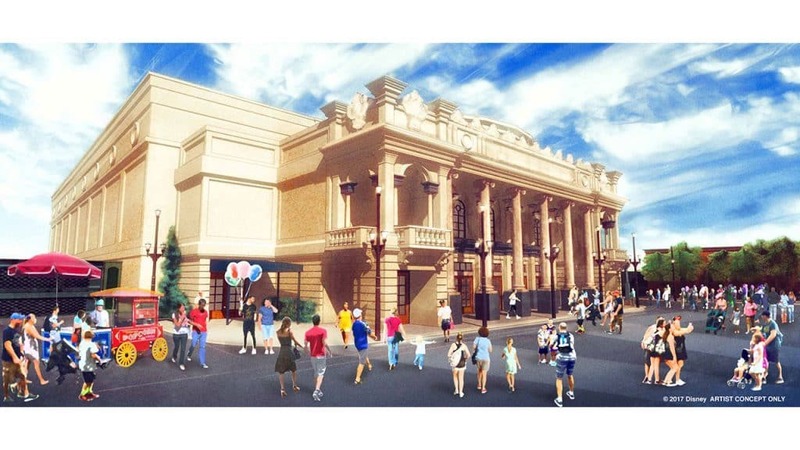 Magic Kingdom is now set to receive its own version of California Adventure’s venue, modeled after the Willis Wood Theater that existed in 1920s Kansas City – a façade perfectly in keeping with Main Street, USA’s iconic atmosphere (and Walt Disney’s personal biography). Though the company specifically namedropped Frozen – Live at the Hyperion while revealing Main Street’s new resident, it’s unknown whether that was meant to convey that an East Coast version of the show is specifically coming or just to underscore the types of productions that will eventually be thrown here. UPDATE (8:54 am 02.12.18): rumors have been swirling for the past few weeks that Disney has quietly cancelled – or, at the very least, indefinitely delayed – this project. We will await the company’s official statement on the matter. When Ratatouille: The Adventure opened three years ago in Walt Disney Studios Park at Disneyland Paris Resort, many a themed fan called for its being imported here to one of the American Disney parks. Now, their wishes are coming true. The trackless dark ride will be arriving at World Showcase’s France pavilion in Epcot, following in the footsteps of Norway and Frozen Ever After. 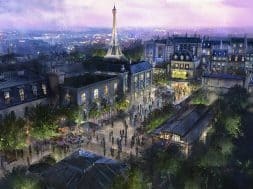 Unlike those two, however, the attraction will be added onto the pavilion, in a new section just past the Eiffel Tower, instead of replacing a pre-existing ride in a pre-existing show building. 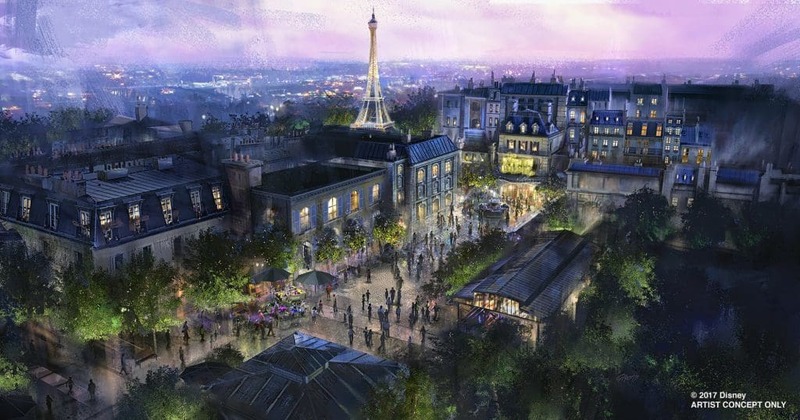 It’s currently believed that this new, American version will be an exact copy of Paris’s original, which has riders get shrunk down to the size of Remy, the protagonist rat in Pixar’s 2007 film, and then makes them scurry throughout Chef Gusteau’s restaurant as he and his patrons attempt to capture them. Few of the announcements that Disney made this past weekend were as popular – and, arguably, as controversial – as Guardians of the Galaxy’s arrival at Epcot. The recent movie franchise is one of the company’s hottest right now, and its arrival at California Adventure two months ago in the form of Guardians of the Galaxy: Mission – Breakout has been a massive success, making the Guardians’ presence in Future World a no-brainer (well, to the corporate suits, at least). While we don’t know what type of attraction, exactly, Guardians of the Galaxy will be (rumors have been heavily pointing towards a roller coaster, giving the park another thrill ride), we do know that its backstory involves a young Peter Quill (better known to Marvel fans as Star-Lord) visiting a brand-new Epcot before his abduction at the hands of alien marauders. We also have its location confirmed: it will be taking over the Universe of Energy pavilion, which has been home to Ellen’s Energy Adventure for the past 21 years. You have until August 13, 2017 to take one final spin with Ellen, Bill Nye, and their dinosaur pals. You can also check out our in-depth retrospective on the attraction’s history – or do both. Let’s be honest: Epcot’s Future World has been in dire straits for the better part of its 35-year history. A land devoted to the infinite possibilities of mankind’s future, it was designed to be a permanent World’s Fair of various technological and sociological exhibits, ranging from the history of transportation to the miracles of biological life to future human habitats all across space. Once the everyday world caught up with the theme park land’s science fiction, however, neither Disney nor any of its corporate sponsors wanted to invest the tens of millions of dollars (or more) to update or replace the various attractions, leaving it an outdated and aging mess. With the update to Mission: Space and the introduction of Guardians of the Galaxy, Disney has started to address the antiquated rides, and now we have official word of what will happen to the area’s overall aesthetics: the company is going back to the drawing board, and it’s tasked one of the original lead Imagineers of the park, Tom Fitzgerald, with overseeing the massive construction project. The concept art was only fleetingly shown during the D23 Expo, but what little we’ve seen of it is intriguing, to say the least. The twin Innoventions buildings will be razed, new water features will be installed, and greenery will be given dominion over all, with trees running rampant and, even, some type of hedge-maze-esque structure covering a good swath of the land. We’ve saved the biggest and most popular announcement for last. Tron Lightcycle Power Run is one of the flagship rides at Shanghai Disneyland, which just opened on June 16, 2016, and for good reason – its “cyber-fi” visuals, pumping soundtrack, unique ride vehicles, and, of course, its gorgeous, ethereal show building (replete with light-changing roof) are the very definition of eye-catching. 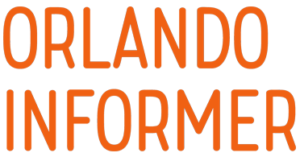 This has gone a long way to explaining why fans have been clamoring for its inclusion at Magic Kingdom’s (aging) Tomorrowland – which, in turn, explains why a company that originally had no such plans to do so just made the announcement that it’s going to do exactly that in time for the park’s 50th anniversary in 2021. 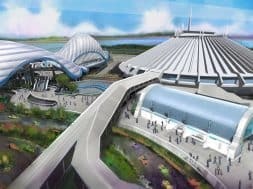 Even better, it’s largely believed that Tron’s presence will be the start of Tomorrowland’s eventual makeover, which is currently speculated to be completed by the middle of next decade (maybe Imagineering will even use Epcot’s Future World renovations as a source of inspiration…). You can find even more info on Tron Lightcycle Power Run’s ride experience in our in-depth feature.